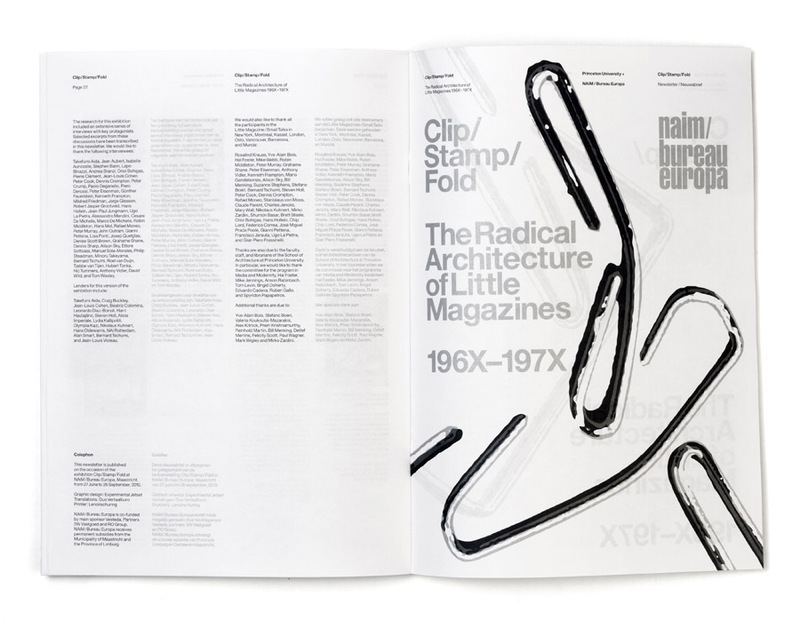 'Clip/Stamp/Fold' was an exhibition (on the subject of architectural fanzines) that was developed around 2006 at 'Media + Modernity', the post-grad research program at the School of Architecture at Princeton University (headed by Beatriz Colomina). This exhibition arrived at NAiM / Bureau Europa already 'pre-designed' – it was a traveling exhibition, with the graphics already included. 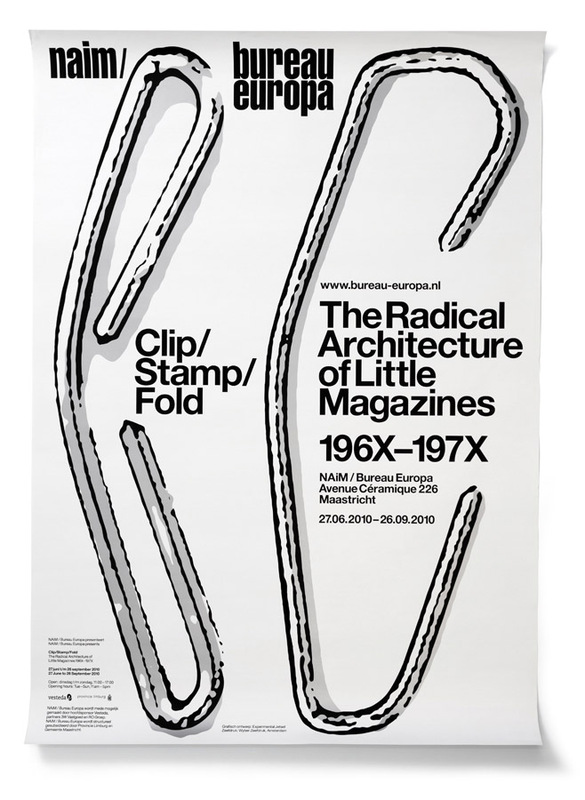 So for 'Clip/Stamp/Fold', we weren't really asked to design any graphic elements in the exhibition itself – rather, we were responsible for the usual, more exterior 'institutional' layer: the posters, the invitation, the window lettering, etc. 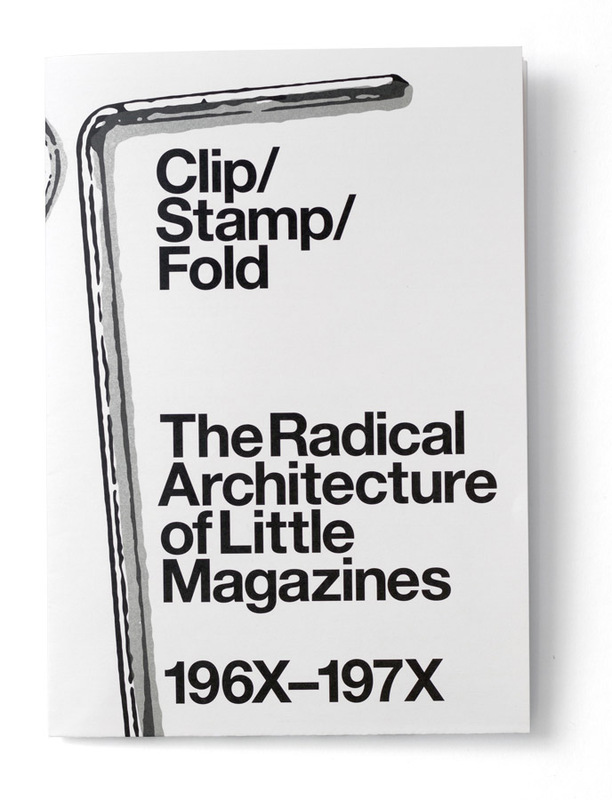 Thinking about the theme (and title) of 'Clip/Stamp/Fold', we immediately had to think about the staple. 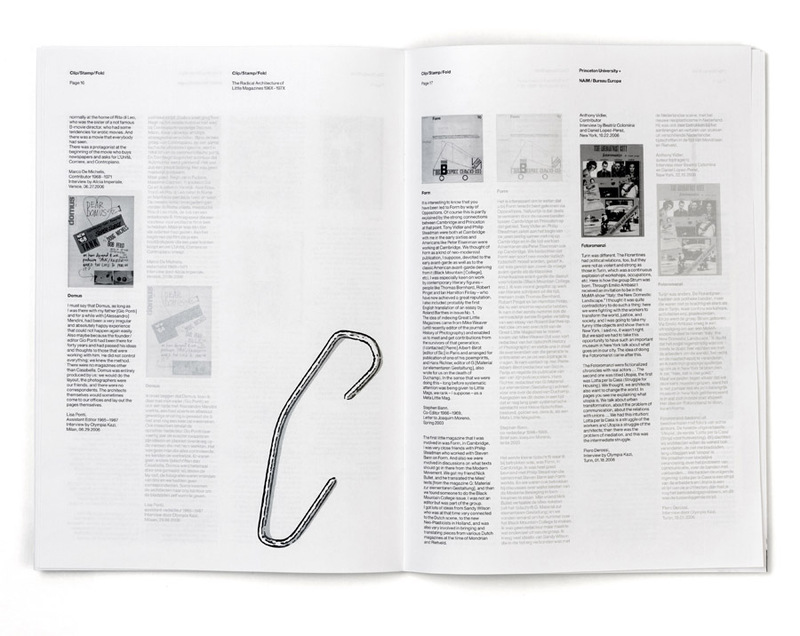 After all, in the process of 'zine-making', isn't stapling at least as important as clipping, stamping and folding? On top of that, we always really liked the notion of 'het nietjesproletariaat' ('the staple proletariat'), a phrase we once came across, basically a term that was used to describe the subculture of fanzines. Now, we don't know anymore just where exactly we stumbled upon it (we vaguely remember it was in an article about the history of Dutch bookstore Athenaeum – we can't seem to find this article anymore), but we always liked that phrase: the staple proletariat. So it made sense to focus on the humble but noble staple. 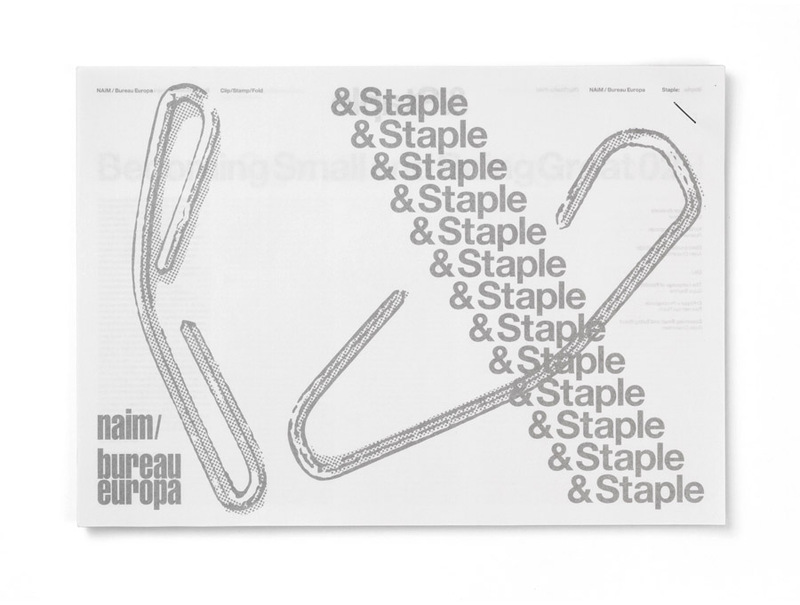 (And now that we think about it – there was one other reason why we had staples on our minds: the fact that we really love the logotype of Staples, the US office supply store. In that logo, the letter 'L' is replaced with a stylized staple – this was something we always liked). 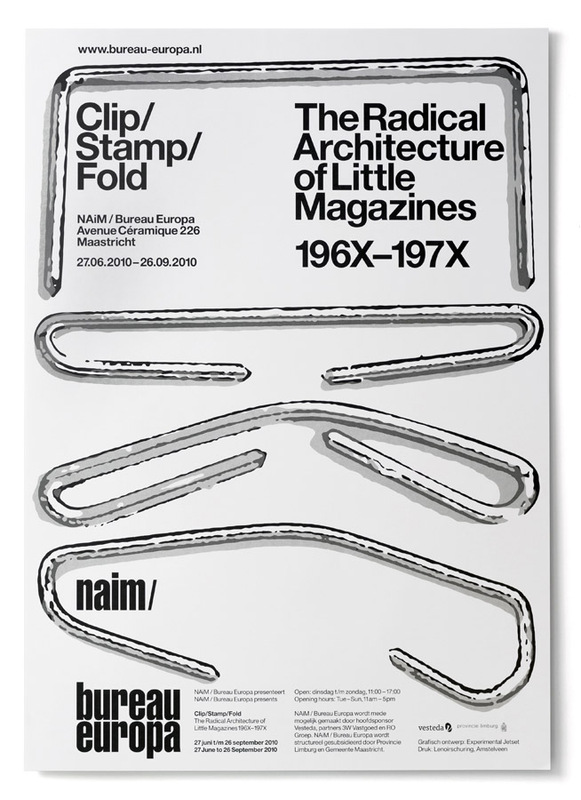 We photographed a couple of staples in our studio, blew them up, and made them more graphic. 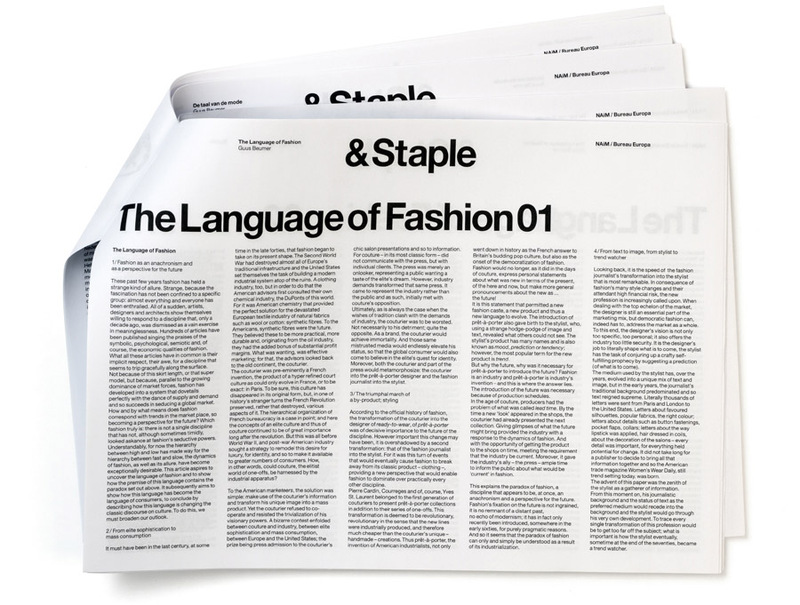 That way, we created a typology (or better said, a sort of mini-alphabet) of different staple-shapes. 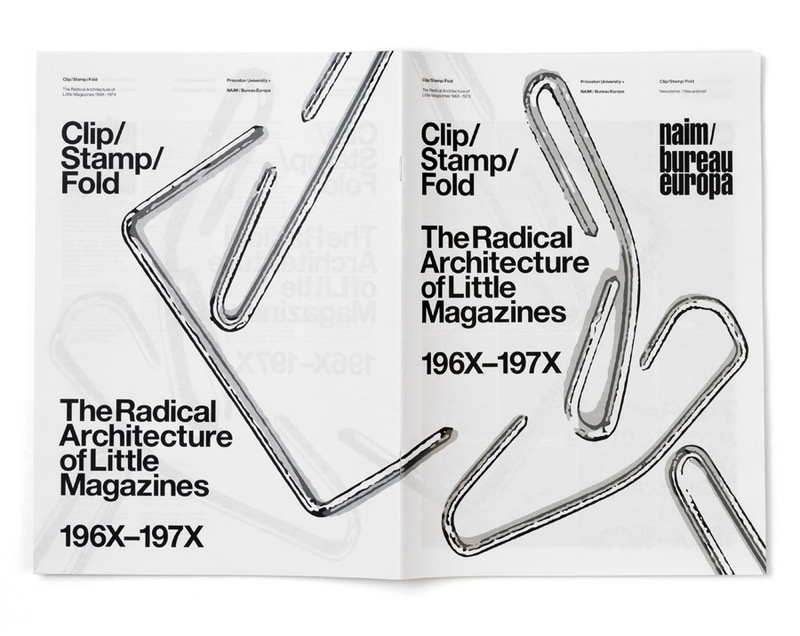 We used these staples all throughout the graphic identity of Clip/Stamp/Fold, in an almost typographic way, creating combinations that looked like abstract acronyms. 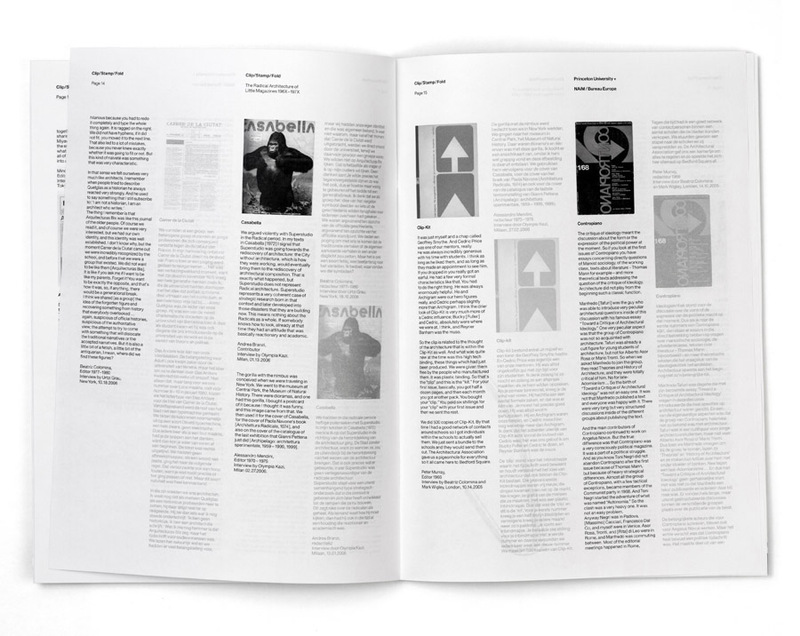 As we already wrote – the exhibition came 'pre-designed', with its graphic layer already included (a layer which included a wallpaper of magazine covers, plastic bubbles, etc.). Still, we were asked to design some lettering to appear in the exhibition: a title wall, some window lettering, etc. As we already wrote, this exhibition was a traveling project – it arrived at NAiM / Bureau Europa as a 'pre-designed' and 'pre-curated' show. 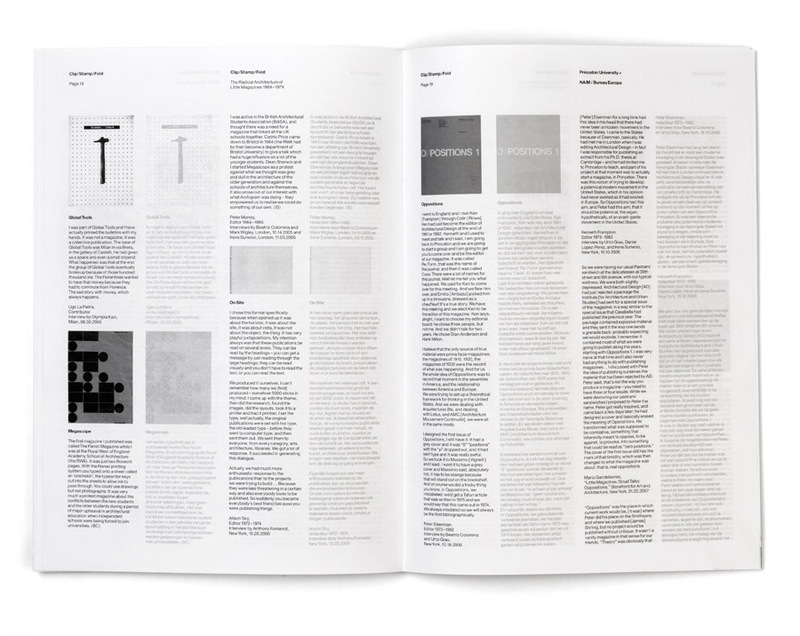 However, within the the institute, there was still a need to add something new to it – an addition or supplement that was more site-specific, more context-sensitive. 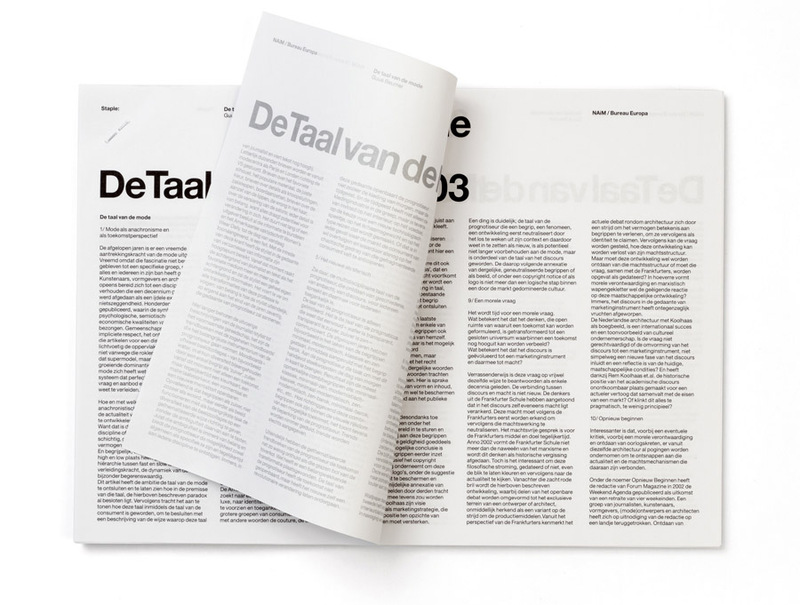 That's why NAiM / Bureau Europa decided to add, to the 'core exhibition', two side-projects: a fanzine, specifically made for the occasion, and a small exhibition on the Dutch architectural magazine Forum. 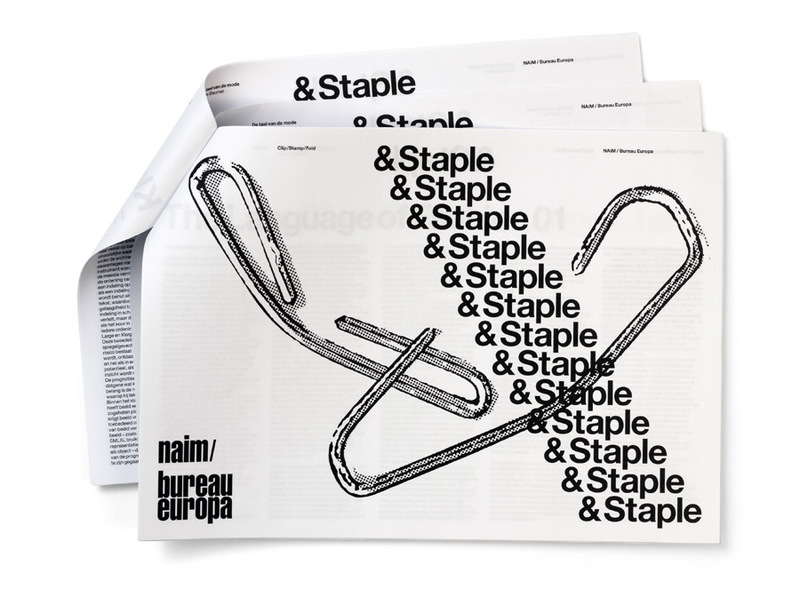 For the fanzine, we came up with the name '& Staple'. We figured that, since the fanzine would be an addition to the main exhibition, its title should function as an addition as well. By adding '& Staple' to 'Clip/Stamp/Fold', the result would be the phrase 'Clip, Stamp, Fold and Staple'; which made sense to us. 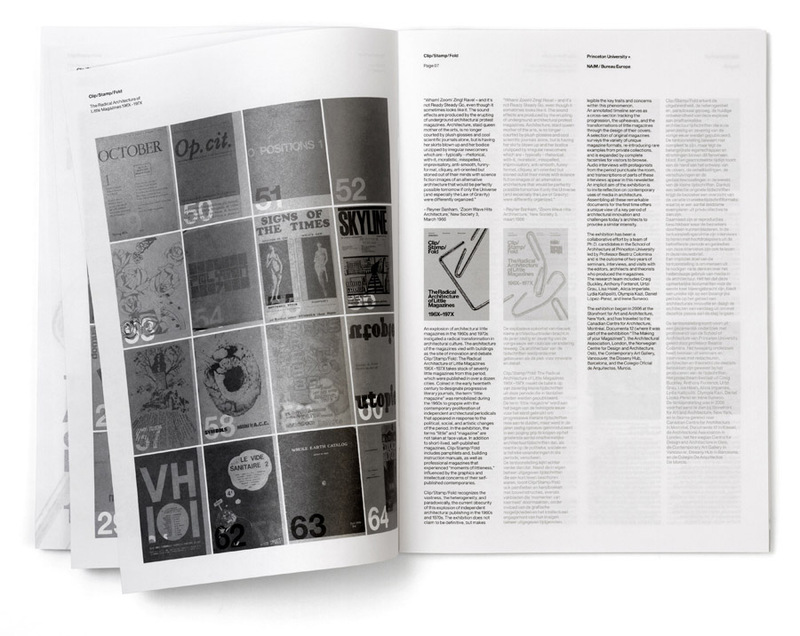 Another element that was added to the main show was a small exhibition on the subject of the Dutch architectural magazine Forum. 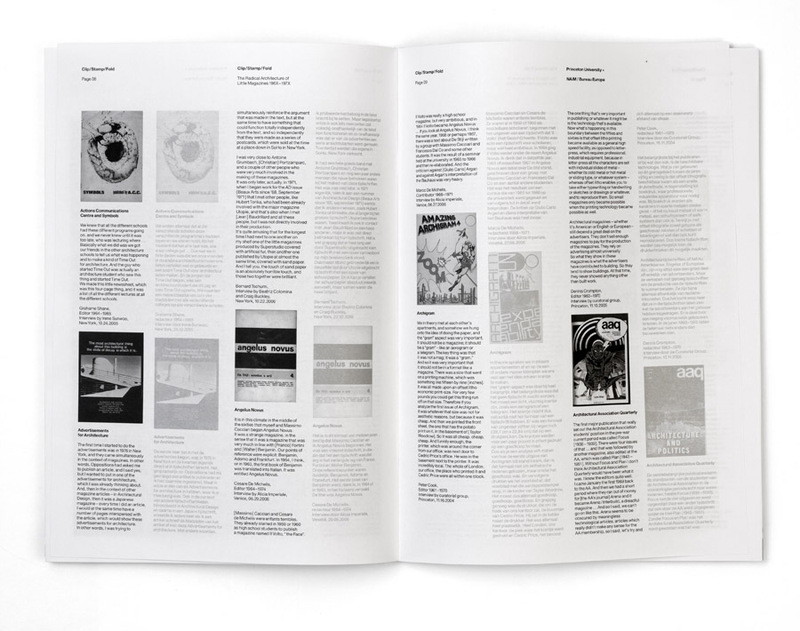 This exhibition was based on a research project by Marina van den Bergen, and consisted of a couple of vitrines (display-cases) showing actual issues of the magazine, some video interviews with editors, and a series of posters presenting a sort of 'timeline' of Forum. 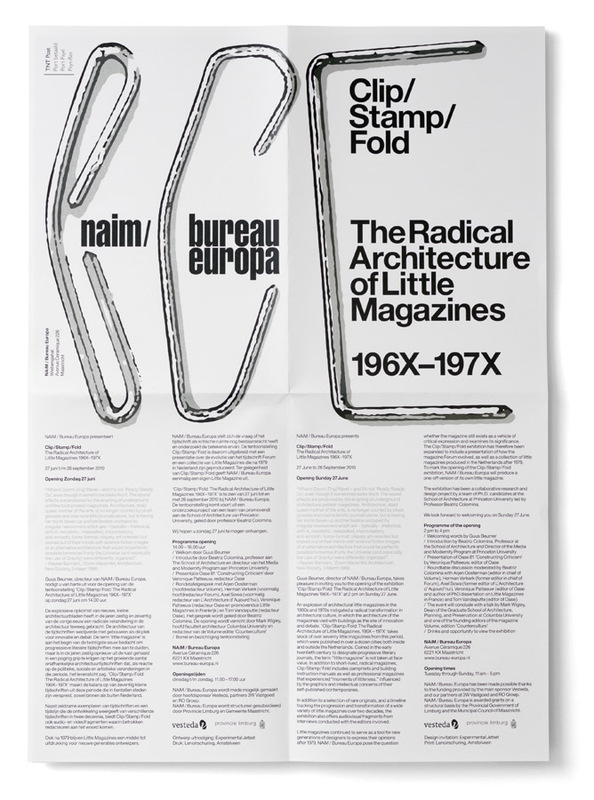 More information about the exhibition, as it took place at NAiM / Bureau Europa, can be found here.